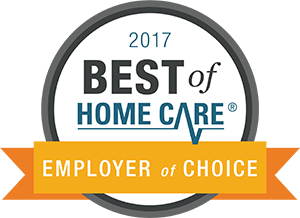 BrightStar Care is proud to announce that the organization has been recognized in five award categories by Best of Home Care for 2017 for their home care and medical staffing services. Most notably, they received the Best of Home Care National Provider designation within the first full year of utilizing the Quality Service Management Program. This is based on having more than 60% of agencies receiving either Provider of Choice, Employer of Choice, or both designations, which includes BrightStar Care Orlando home care. With 61 agencies designated Provider of Choice, BrightStar Care has the highest number of Provider of Choice agencies of any other brand evaluated by Best of Home Care. These agencies have received the highest in satisfaction scores from their current clients, reassuring prospective clients that this provider is dedicated to quality, trustworthy home care. BrightStar Care also has the highest number of Employer of Choice designated agencies with 41 agencies qualifying. This is awarded based on current caregiver satisfaction scores with their employer. This recognition lets our clients know that the home care provider they have chosen is dedicated to supporting and training their caregivers to provide the best possible in home health care. BrightStar Care ranks number two amongst the Leaders in Excellence Award winners, with 14 agencies qualifying. This award is only provided to the select few providers who have received the highest client and caregiver satisfaction scores in all categories. Started as a family business in 2002, BrightStar Care was founded by Shelly and J.D. Sun to provide a full continuum of home health care for families and individuals in need. BrightStar Care’s services include adult, elder, and child care, as well as medical staffing services for individuals, families, and healthcare facilities. BrightStar’s Orlando agency was founded by Raoul Guerra and aims to empower those who need care and their loved ones to live well at every stage of their life.